Forsythbiz: McD's to honor the military on Veteran's Day! Forsyth MO. 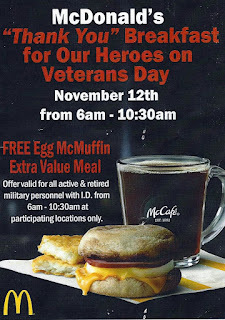 In what I assume is a Nationwide promotion, McDonald's is offering a Free Egg McMuffin Extra Value meal to all active or retired military personnel who present an I.D. This event is set for Monday, November the 12th which coincides with Veterans Day! I fully embrace this concept, but would also like to see others like it. How about honoring our Men and women in Blue, or our Fire fighters or EMT's. Perhaps a special Service Day could be set aside for them in the future.